Brass: love it or hate it? My new house has a crazy mix of fixtures and hardware. I'll give you a tour. Above is the light fixture inside the front door. Here's one in the second floor hallway at the top of the stairs. My favorite. The door hardware is gorgeous. The knobs and backplates are almost all original, and there are a ton of them since every room has three doors in it. (This is no open-concept house, that's for sure.) Look at that plate on the pocket door. So pretty. 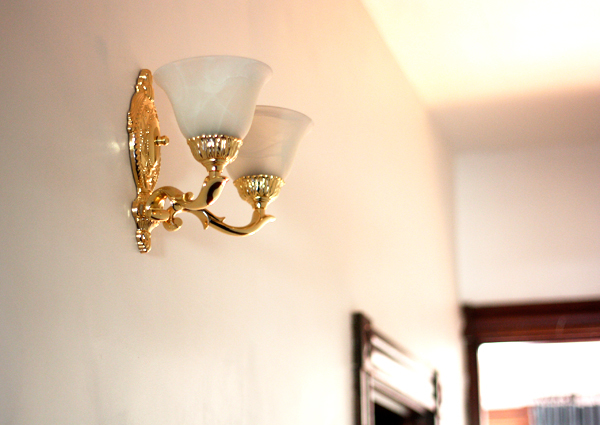 Here's a hallway wall sconce as we head back toward the dining room. Hmmm. Yellow. It coordinates with the bright yellow dining room chandelier. 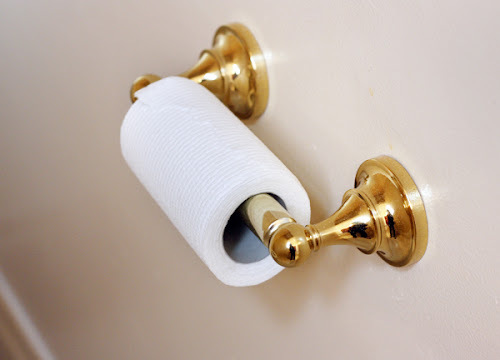 A lacquered brass-plated toilet paper holder will make you feel like a king sitting on a throne. Fancy. Which brings me to this. The downstairs bathroom has matching fixtures, but they're eclipsed by the navy painted-over sheets of plastic faux tile on the walls, lending the room a creepy cave-like feel. The wallpaper adds something, too. I don't know what the something is, but it's not good. And then there's this guy in the kitchen. This is not a black and white photo—the fixture is nickel and charcoal gray. I have to admit that before moving in, I had no interest in brass, copper, or gold of any kind. And now my tastes have done an about-face. (I just pictured my tongue flipping 180 degrees and it was a weird mental picture.) I just can't visualize a lot of shiny chrome, nickel or stainless steel in here. Some silver surfaces are nice mixed in, but the warm wood and age of the house seem to call for darkened, aged brass. The bright yellow 80s stuff is still pretty unappealing to me, but bronze, brass, and copper metallics are making a comeback in accessories and interiors. What do you think about brass? You're welcome to decorate my home any time! 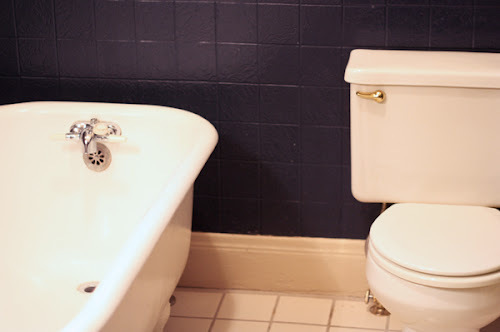 I agree 100% on the old vs. new, the painted faux tile and the wallpaper in the bathroom. But mostly I am jealous of your pocket doors. Every fixture needs a lovely patina in an old house, that's my thought. Hit the antique sites. We live in an 1890 house. I love the aged brass because it fits so well with the house. I hate the yellow shiny stuff though! eesh! Unfortunately, over the years, much of our original stuff has been painted over (and over and over...) and we never seem to have the time to rectify. It's an 1890 house---something happens here EVERY day! I don't like your 80's brass either. There are spay paint products that can make it look like old brass, or just a dark color (bronze?). 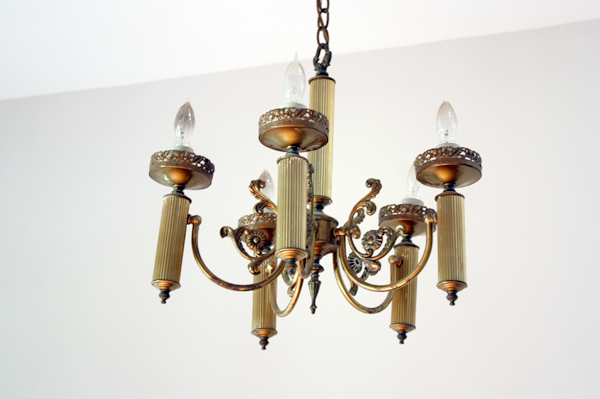 Your favorite chandelier can be reversed to have the light bulbs go upwards- like a true chandelier. The entry hall fixture is missing it's globes. I'm guessing it's a 70's chandelier made to look like an oil or gas lamp from the 1800's. And that is my least favorite! I've been researching how to get the lacquer off 80s brass so it will start darkening. Or I might spray paint them darker like you suggest, JE, or try some Rub N Buff on stuff that doesn't get handled. I would LOVE to replace everything when I win the lottery, but until then, I welcome any cost-effective fixes that would make them less obnoxious. Thank you for confirming my guess on that entryway fixture. I don't know anything about antiques or dating stuff, but it seems newish pretending to be old, to me. I like aged brass. New is too shiny for me. Funny, I was just reading about a product called simply- Brass Ager. Looks easy enough. I'm sorry about the bath, but I'm sure you'll make it beautiful. Brass Ager!? I will investigate! Thanks! I have had the same kind of change too. I just moved into a house in Joliet that was built in 1915. It has been completely remodeled, which was good for me because I don't have the time or money to reno. The one thing that was not kept, however, were any of the door knobs or hinges. Initially I thought this was not an issue, but now I really miss them. 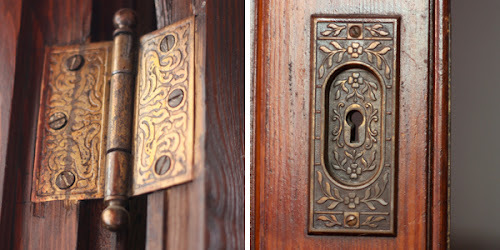 I never thought I would want to bring brass into my house, but I am really contemplating finding old knobs and hinges and re-replacing them. I am finally convincing my hubby to switch out the brass to brushed nickel, only to see more brass/gold on decorating blogs. So apparently I have held on long enough that they may be coming in style again. I don't think you could get the lacquer off the gold brass without removing brass color, since it is only plated. I think you would have better luck spray painting to age/darken it. 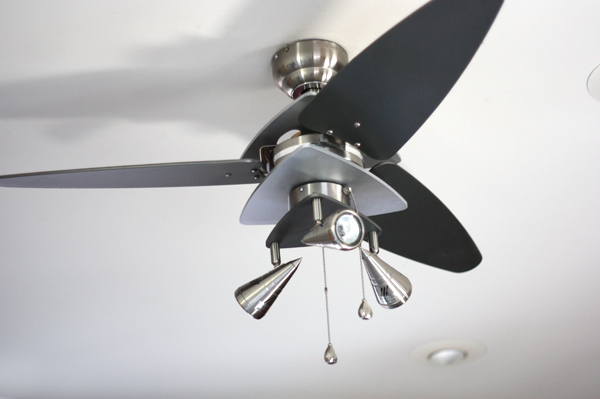 And what in the world were they thinking with that extremely contemporary and silver fan? Yowsa. A couple of blogs I follow have even spray painted faucets with good results. Like others, I am NOT a fan of bright yellow brass. Most of that seems to be brass-plated anyway. I do like the old brass (which is solid) with patina, which has a lot of character and doesn't look like everything else. I have seen metal fixtures spray painted with one of the metallic Rustoleum colors and they looked great. Perhaps you could find one close to the color of the older fixtures in your house and paint them so they'd at least blend in. The original hardware in the house is drop-dead gorgeous. I'm scratching my head wondering why on Earth someone would put such a modern ceiling fan in that age of a house though! Here is a tutorial for aged brass that includes Rub'n Buff. 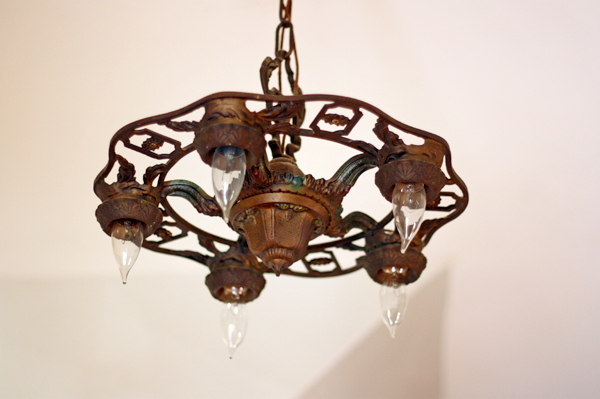 your old fixtures are exquisite! i love the patina of old brass. the antique chandy looks to be brass plated over copper (c. 1900? ), and the copper is beginning to show through - a patina i particularly love. like in so many older homes, there's some diy gone bad, but i can't wait to see you bring it back to life! Love your hinges and the pocket doors. I'm with the others on the yellow brass, yech. 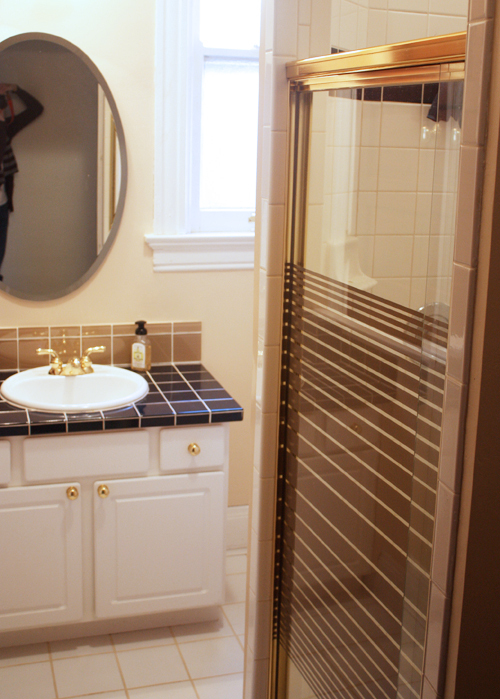 My old house had plastic tile in the bathroom, yech as well. Luckily it's super easy to pop off, just slide the flat head of a screwdriver between two of them, pull a little and pop, it's off. We put up wainscot paneling and didn't even have to sand the tile adhesive off. Pretty cheap too. I love gorgeous vintage brass (maybe bronze?) with the warm patina. Particularly good pieces have a weight to them that almost nothing modern matches. I run screaming from brass! OK, that's dramatic, I just avert my eyes. 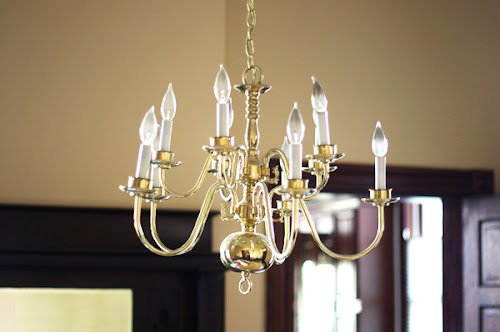 I have a chandelier in the dining room that is brass and I could definitely do without, but it's funny how the stuff that really annoyed me when I first bought the house I don't even notice anymore. Every once in a while I will walk into the extra bathroom and look into the wicker-framed mirror and tell it I hate it, but it's never quite enough to get me to do something about it. As for the old brass, I say go with it. Be true to the house. Try to age the new stuff. Those brass door fixtures are to die for! I dislike brass pretty strongly, but even I would keep those! And the kitchen fan is amazing. I'm glad you pointed out it wasn't a black and white photo, because that's exactly how it looked at first glance. I would definitely be getting rid of the yellow shiny stuff, though, personally. You know, I love the second and third photos b/c of the shape of the objects. The others remind me too much of growing up in the 80's and 90's, lol! Not crazy about shiny brass. I like bronze better but like satin nickel best. That pocket door hardware is amazing!! I can't stand the yellow stuff, but the aged stuff like your hinges and door hardware - that's a different story. I think I just suffered hinge envy! LOVE the old hardware on the doors! You're lucky to end up with those! I just toured a bunch of homes in the Parade of Homes and noticed that the high end builders are mixing the finishes with oil rubbed bronze. It looks great with any finish. A great option for the bathroom sink fixtures where you probably won't find a good antique brass solution. Thanks, that's a great tip! LOVE aged brass. Those plates and hinges are gorgeous. YES! I've been in inbetween with brass. Sometimes I love it, sometimes (like your 80's example) its just too much. Piece by piece! I love brass, if done correctly. I'm with just about everyone else in the nice if its old and a bit dodgy if it's hotel-lobby brass! Those hinges are to die for, I hope you have a blog-reader-proof lock on the front door! I am in love with the oil-rubbed bronze finishes, and I think they would go well with the other, more authentically antiqued fixtures in your house! I can flip my tongue 180 degrees! (about the horizontal-saggital axis.) I imagine, like tongue rolling, the ability might be genetic, but it still takes a little practice. The trick is to lead with the edge that is going to rotate downwards. I like the more antique finished brass, but the super yellow stuff, not so much. That dining room chandelier is much the same style as my parents, what with the fat globular shape on the bottom, though theirs is an antiqued finish. So jealous of the door hardware! Your amazing door hardware takes my breath away! But the bright yellow brass stuff is definitely not-so-good. I've had decent results using inexpensive spray rust-colored primer to re-do metal fixtures in case you want to cover them up before committing to new purchases. Yes to the old brass. No to the lacquered brass. The ceiling fan in the kitchen looks like a food processor. 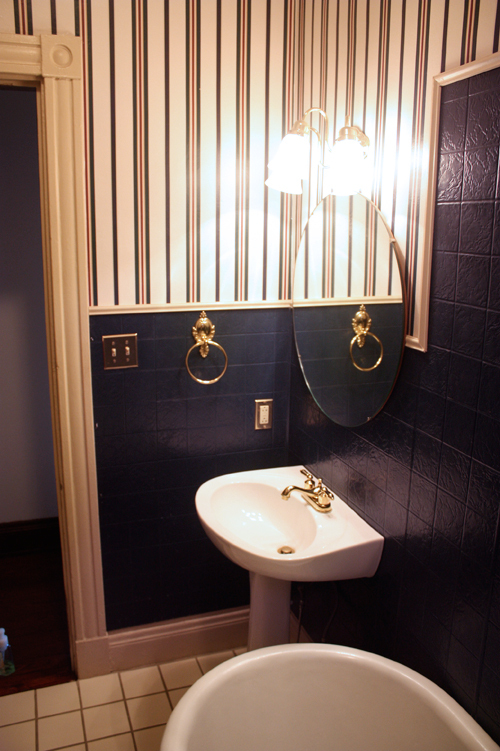 I like the navy in the bathroom but would paint that area white and paint the wall papered area above it white. Okay, I screwed up my previous comment. Bathroom would've be white below and navy above. I agree with you 100%! Antique Brass is gorgeous. Brass, love it! The whiter parts of the house look great with the aged brass. The shiny bright gold needs to be tarnished though.. Except on the toilet handles. Toilet handles/taps should look clean and luxurious for catharsis. I don't have one but will try to borrow Alex's sometime! Love the hinges, don't like the rest! Good news is, spray paint is cheap. Have you tried old-style round bulbs in the fixture in the No. 2 image? Old downlights -- which often are polychrome cast aluminum and not brass,despite the color -- usually were fitted with plain round, bare bulbs and not shades or globes or flame bulbs or something else to obscure their technology. These fixtures were installed when electric lighting was relatively new and still a status symbol. People wanted the light bulbs in their homes to be seen. Technology and fashion cross paths in aspiration. Not many years ago, we hid bulky televisions inside cabinets. Then thinner, initially pricy flat screens became available, and no matter how big or ugly, everyone wanted them visible. Decorators told us to put them in place of pride, so over the mantel they went. Now that some of the new has worn off (and the price has dropped), flat screens seem to have migrated to the gallery wall. It will be fun to see what comes next. If you hate the downlight, have it appraised by someone competent, rather than paint or otherwise change it. These old pieces are difficult to find and expensive. Many offered for sale have been so aggressively and improperly cleaned that they are permanently damaged. Even some “restorers” give them ugly finishes they were never meant to have. We have some similar door hardware. As well as some of the 80's gold light fixtures. My husband HATES all of it. He loves brushed Nickle. I don't hate it nearly as much as he does.. especially the nice, detailed door hardware. I think some polishing could really bring ours to life. But I doubt I could convince him of that. Our house is from 1955, so I think the contemporary brushed nickle will look just fine in a mid-century modern home. I just hate to get rid of a charming element, especially if the material is making a come-back, like you said (I've been hearing the same thing too)! Anonymous, changing the bulbs is a GREAT idea! It will look so much better! I never would have thought of that. I like that fixture and it's definitely staying. Something needs to happen to all that yellow 80's brass though, for certain. Thanks for all the tips, everyone! So helpful! Cheap yellow brass is so wrong! We are just moving into a 1930s home that has a mix of vintage pieces like your first two and horrid 70's fixtures - I'm discovering a new love for oil rubber bronze! One of the first thing I did when I moved into my house was take out the tacky 80's light fixture above the dining room table - think shiny brass plus cobalt blue glass. I have come to terms with the brass handles on the pocket doors. BTB, love footed tubs. It's probably cast iron, which retains heat much longer than plastic. Extra long soaks! Yes, the old brass fittings seem to fit in - the "new" brass is too...brassy?? The painted faux tile and wallpaper in the bathroom are just waiting for you to do something awesome with them - after all, it'd be boring if it was already all perfect! Same happened to me. We bought a victorian house a few years ago. We'd come from a stainless steel and nickel clad 1930s modern flat, thinking we'd follow the same lines but in our new house it looks cold and slightly wrong. We have some copper but I think that if it aint Tom Dixon there's a chance ot will date. I hate gold or gilt- it's just nasty, but I'm warming to brass. It has a neutral appeal.